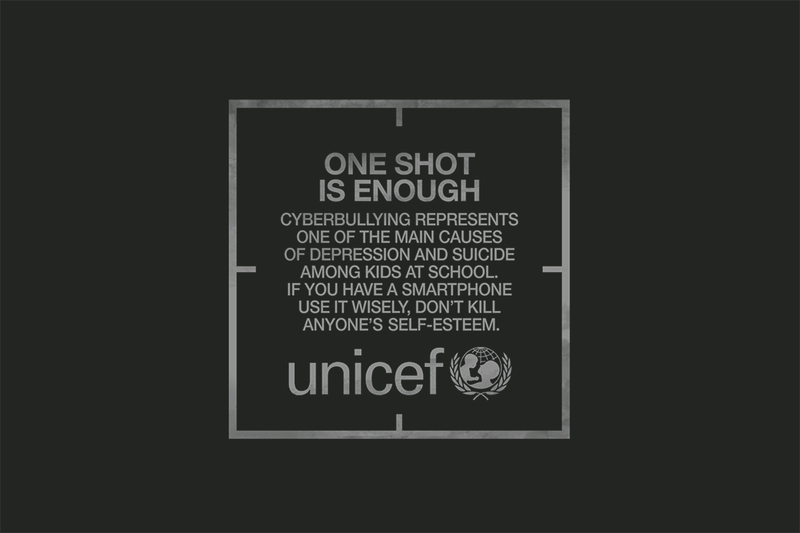 UNICEF Chile’s “One Shot” campaign on cyber bullying won a set of gold Press and Outdoor Lions at Cannes Lions International Festival of Creativity 2015. 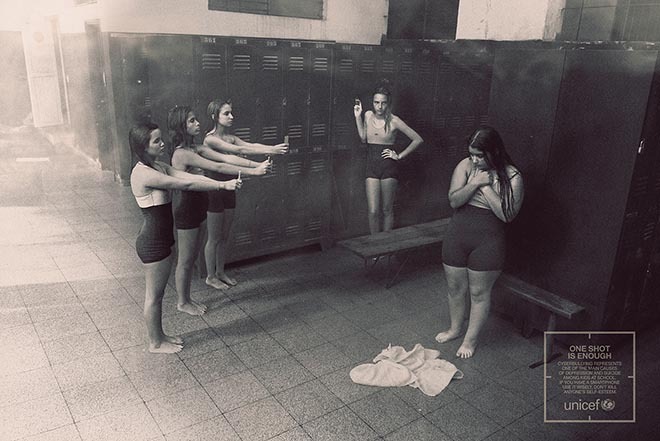 Three executions, Fatty, Nerd, and “Weak”, show groups of teenage students aiming their smart phones at their peers, as if in a firing squad. The copy: “One shot is enough. Cyberbullying represents one of the main causes of depression and suicide among kids at school. If you have a smartphone, use it wisely. Don’t kill anyone’s self-esteem.” In a school’s changing rooms three girls use their cameras to photograph a girl with a fuller figure, while another much thinner girl looks on. 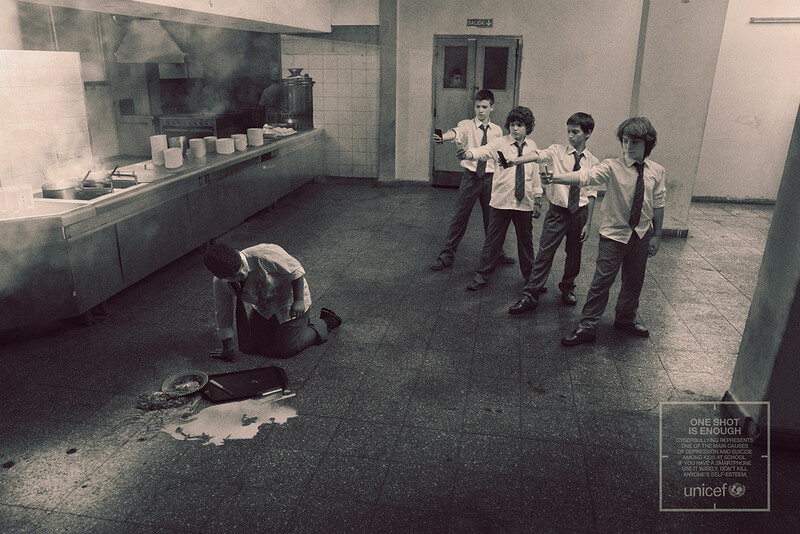 In a school cafeteria four boys snap photos of an unfortunate peer who has dropped his meal tray on the floor. 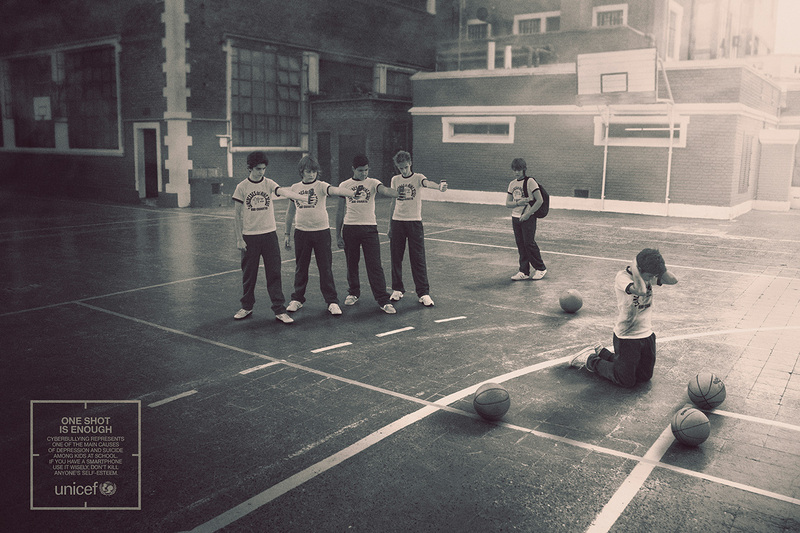 In a school gymnasium four boys use their phones to shame a peer who is surrounded by presumably dropped basketballs, while another looks on. The UNICEF One Shot campaign was developed at Prolam Y&R, Santiago, by executive creative directors Alvaro Becker and Francisco “Cruncho” Cavada, head of art Emerson Navarrete, Jaime Díaz Campistó, art director Sergio Araya Caneo, and art director Sergio Edwards, with photography produced at Machado Cicala Morassut (MCM).